Motion Index Drives can offer a turnkey solution for weld positioning system applications that don’t require any other interfaces or integrations. In this application we utilized an Allen Bradley 525 PowerFlex Drive control panel that has limited step logic to accomplish what you need for a cost effective solution paired with fixed rotary index tables. The control panel has a simple enclosure to enable running of 120V and converting to 3 phase 220 V to operate the high efficiency gear motor on the trunnion indexer. The panel is preprogrammed by Motion Index Drives to ensure your safety and convenience. The drive is equipped with a Safe-Torque-Off function, to help protect personnel and equipment. 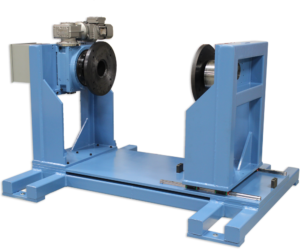 The trunnion shown has the ability to be adjusted to different length settings to accommodate your tooling requirements. In addition the tail stock bearing assembly is also has the ability to telescope in and out for fine tuning when placing new parts in or taken them out. It is also machined and painted to meet industry standards in a laboratory setting to minimize corrosion, as well as completely sealed machine surfaces to eliminate intrusions.